The Horror Writers Association (HWA) is the main organisation for authors writing in the horror and dark fiction genres. The HWA have run the hugely prestigious Bram Stoker Awards in various categories since 1987. Yesterday the HWA announced the Preliminary Ballots for the 2016 Bram Stoker Awards. It's an exciting list. And ... one of my works, Harvest Festival, is included in the category of "Superior Achievement in Long Fiction"! THE Bram Stoker Awards! THE BRAM STOKER AWARDS!!! 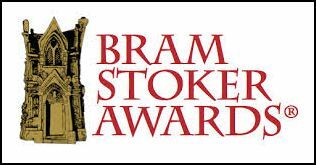 Past winners of Bram Stoker Awards have included Stephen King, Clive Barker, Ray Bradbury, Thomas Harris, Richard Laymon, George A. Romero, and J. K. Rowling. Have a look and add items to your TBR lists! It's the biggest thing to happen to me in my writing career. I'll share the full 2016 Bram Stoker Awards Preliminary Ballot list below because I'm sure every entry on it will be a great read, and I intend to buy and read many of the books from it. It's a ready-made reading list from 2016 for fans of dark fiction. Please support the writing of all the authors who have been included in the preliminary ballot. If you want to know what happens next: lots of voting in the HWA. Then on February 23rd they will announce the nominees. Please keep your fingers crossed for me, this would be huge! You can also play the start of my novella. Well done! That must be super exciting! The Bram Stoker Award is huge! Congratulations. I'll keep my fingers crossed for ya. That is amazing! I'm not much of a horror/thriller reader, but even I have read some of those authors or recognise their names! Immense! Well done. Who Determines What A Word Means?